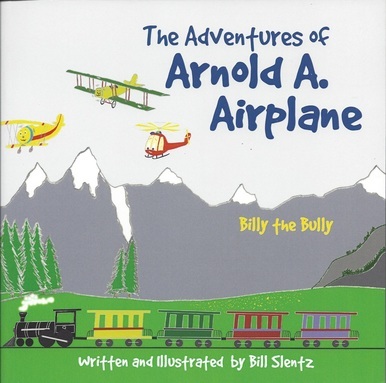 Bill Slentz, author,illustrator and pilot, has found a way to communicate and open discussion with children using airplanes. He addresses issues such as bullying, overcoming limitations and disabilities, respect and appreciation for elders and those who sacrifice to maintain our country's freedom. Families, teachers, and children will enjoy learning about life's issues and privileges as they imagine flying through the sky with Arnold and his friends. Our hope at Slentz Publications is that The Adventures of Arnold A. Airplane series will provide families, teachers, foster parents, and others a fun and creative way to teach and open discussions concerning morals, values, and life's lessons and possibly spark a child's interest in airplanes and flying. On the first page of each book, parents can read about a personal experience taken from the author's own journal and an explanation of why he felt the need to write the book. ​“Old Bert’s New Beginning” is a valuable tool in helping children to understand that death is not the end if we have a personal relationship with God through his Son Jesus Christ. In the story, Old Bert experiences mechanical problems that can’t be repaired and is laid to rest by his dear friends. However, one soon discovers that the Great Mechanic is able to fix Old Bert and give him a new life in heaven. Death can be a difficult concept for young and old alike to understand or explain. This story helps to give us all a greater understanding of the hope that we can have, even in the midst of grief, and reinforces the all encompassing love of God. As a teacher, school administrator, and grandparent, I highly recommend having this special resource on your shelf to share when the need arises. Its powerful message will prove to be a comfort to those experiencing loss. After being mean to Billy in a previous meeting, (Billy's Big Decision) Benny Bellanca, after a big rain at the old airport, runs out of fuel and must land in the mud. Unable to free himself, he cries "Mayday" when he sees Billy and friends playing in the sky. At first Billy is reluctant to help but Arnold convinces him that would not be the thing to do. The friends join together and pull Benny out, after a struggle. This is a story with examples of teamwork, forgiveness and changed hearts. This ninth book in the Arnold A. Airplane series of moral values and life lessons, will give parents, teachers and others another tool to open a dialogue with children concerning forgiveness, acceptance, teamwork and friendship. Like all the author's previous books, Benny's Best Day is written in rhyming prose with colorful, whimsical illustrations. While flying on a Fall day, Billy B. Barnstormer is approached by a new plane, Benny Bellanca, who offers him a fuel additive that he says will make him fly higher and feel better than ever before. Billy reluctantly tries the new “stuff” and after flying great for while, suddenly becomes very sick. After landing in a very remote spot and feeling tired and lonely, he finally makes it home to his parents. He truthfully tells them the entire story, good and bad, and regrets his very bad decision. This little story, in rhyming prose and colorful illustrations will hopefully give parents and teachers an elementary way to open dialogue with their students and children on the issues of drug and/or alcohol use and abuse and the associated risks. 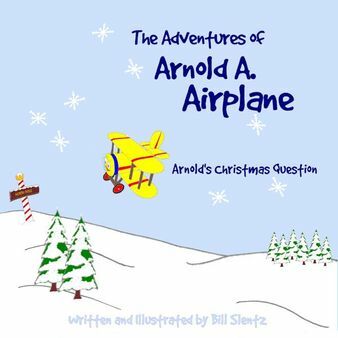 "Arnold’s Christmas Question" is the sixth in the “Adventures of Arnold A. Airplane” series. In this newest adventure Arnold teaches a valuable lesson about the true meaning of Christmas that will be treasured by young and old for years to come. Arnold travels to the very cold North pole to ask Santa where the giving of gifts at Christmas all began. In this fun-filled lesson, Santa helps Arnold understand the true meaning of Christmas and that the giving of gifts began with God’s Greatest Gift to man, the birth of Jesus. Filled with more colorful and whimsical illustrations, and continuing in rhyming prose, we are sure you and your children will enjoy traveling with Arnold in his latest great adventure. "My hope and prayer is this little book will give parents a way to open a discussion with their children concerning the true meaning of Christmas without necessarily ruining the fun associated with Santa Claus." "Herman's Ordinary Day" is the seventh book in the Adventures of Arnold A. Airplane. Herman, Arnold, Mary and Billy are having an ordinary day of flying fun. Herman suddenly becomes very serious and starts thinking deeply about the world, life and such. He then asks old Bert about the origin of life and why we are here. Wise old Bert answers his questions simply but profoundly in a delightful way.This little reader is a great way to open the discussion of Creation vs. the Theory of Evolution with your children. In this fifth book in the "Adventures of Arnold A. Airplane", Old Bert the Bomber, a WWII Veteran airplane, has been refurbished and is now teaching younger planes at the Hangar 1 Flight School. One evening Old Bert sees a plane in distress in a storm and helps her and her children by providing a warm hangar, fuel and a warm place in his heart. . As in all the books in this series, the rhyming prose is entertaining and the illustrations whimsical and colorful while assisting parents and teachers in providing lessons on morals and values to their children. "Christine the C17" teaches unselfishness and loving and caring for others. In the fourth book of the Adventures of Arnold A. Airplane series, "Merry Mary Monoplane" is the newest of Arnold's and Herman's friends. She is a beautiful little monoplane who always seems to be very happy even though she was made with a disability and has endured many visits to the mechanic. She has a small oil line with a big problem but is still able to live a great life and help her friends. In fact, she saves the day for Arnold and Herman who are destined to get a bad grade in flight school until Mary decides to help. My hope is, this little book will encourage children, who are afflicted with a serious disability, to concentrate on the many wonderful things they can do rather than on the few they can't. don't think of the few things you can't do, just think of all those that you can." Herman also demonstrates how to be happy rather than jealous when a friend does well. "Old Bert the Bomber" is the third book in the “Adventures of Arnold A. Airplane” series. Old Bert is an old, sad and lonely World War II bomber plane that Herman happened to see when passing by an old deserted airport. Since it is too windy for Arnold and Herman to fly, they decide to spend the day at the old airport just down the lane to see if the old airplane that Herman saw earlier is still there. It doesn't sound very exciting to Arnold but since they have nothing else to do and can't fly due to the weather they decide to go. When they arrive Old Bert is being teased and abused by some younger planes. Arnold and Herman feel sorry for him and, after the young planes have gone, ask if there is anything they can do to help. Old Bert asks them if they can just stay and talk for a while and Herman thinks why not, we have nothing else to do. Old Bert tells them great stories of his youth and the war, with lessons on respecting our flag and the people who defend our country and those who have given their lives to protect our liberty. They find it is not only interesting but also great fun to listen to Old Bert. Since he is now a new friend and is far too important to stay alone and sad. They invite him home for dinner. The morals presented in this story include respecting our country and our flag, remembering and respecting those in our armed forces and their families and treating older people with respect and honor. Like the other two books in this series, it is written in rhyming prose and should be easy for children to understand. The illustrations are simple drawings with bright colors that should enhance a child’s imagination and, possibly, spark their interest in flying. The photographs (credits) at the end of the book include actual photographs of models Arnold, Herman, Billy and Old Bert built by the author. A. Airplane series is a fun but somewhat serious look at bullying and how each of us are special and different but can still be the best of friends. It teaches about facing and gaining control of our fears and apprehensions. "Everyone is different in their own kind of way. That's why life is fun, that's what Arnold would say. are on noses. All quite ourselves from our heads to our toeses." The first in the Arnold A. Airplane series teaches family values and unconditional love. Arnold is taking off on his first solo flying adventure. His mother instructs him to behave and stay safe but Arnold chooses not to listen and goes off to do his own thing. He gets himself into a dangerous situation and is afraid. Arnold discovers that his dad was watching all along and comes to Arnold's rescue. This little bi-plane experiences unconditional love while learning that wrong choices come with consequences. The story of Arnold A. Airplane’s first solo flight is well constructed, and the action progresses in a logical and lively manner. The plot itself is compelling enough to hold the attention of even young children who will need the story read aloud to them by an adult, with age-appropriate vocabulary and gentle lessons about faith and family that should appeal to all ages. The writing in The Adventures of Arnold A. Airplane is fluid and imaginative. It’s often difficult to tell a children’s story via rhyme without having the text sound contrived or awkward, and I believe the writing here pulls this natural flow off very successfully. The illustrations are bright and whimsical and provide great visuals. This is a true story of three friends that set out on a cross-country flying excursion on a beautiful Saturday morning in the fall of the year. They flew 5974 miles around our great Country in 8 days, landing in 30 states. This book, primarily written for adults, is a detailed description of this epic flight and allows you to experience the thrill of each take-off, flight and landing along with the humorous, beautiful and sometimes "white knuckle" experiences along the way.